Attila, Suicide Silence, Volumes, Spite and Cross Your Fingers have announced a summer tour together. Dimmu Borgir will return to North America in August to perform four exclusive shows in support of the new album EONIAN (out May 4th). Author capitalchaostvPosted on March 31, 2018 March 31, 2018 Categories News, Tour DatesTags 25th anniversary, hemlock, metal, SevidemiC, TourLeave a comment on Hemlock Announce 25 Year Anniversary Tour with SevidemiC! Social Distortion have announced a headlining North American tour. Aaron Lee Tasjan, Low Cut Connie, and Jade Jackson will serve as support on select dates. STYX: Tommy Shaw (vocals, guitars), James “JY” Young (vocals, guitars), Lawrence Gowan (vocals, keyboards), Todd Sucherman (drums) and Ricky Phillips (bass), along with the occasional surprise appearance by original bassist Chuck Panozzo—would eventually transform into the virtual arena rock prototype by the late ’70s and early ’80s, due to a fondness for big rockers and soaring power ballads. Over the course of their 40-year career they’ve released 15 studio albums, six best-of compilations and four live albums, garnering eight Top Ten singles. STYX has sold over 30 million albums worldwide. Throughout their illustrious career, they’ve performed more live shows since 1999 than all of the previous years of its career combined. Two Super Bowl appearances, Pollstar box office chart-topping tours with Def Leppard, Journey, Boston, and Bad Company (to name only a few), two more studio albums. September 2, 2016 marked the long-awaited release date of STYX: LIVE AT THE ORLEANS ARENA LAS VEGAS on DVD, Blu-ray and Digital Formats via Eagle Rock Entertainment. It captures the band performing in July 2014 such fan favorites as: “Too Much Time On My Hands,” Fooling Yourself (The Angry Young Man),” “Renegade,” and more. It also includes a special surprise visit from Don Felder—formerly of the Eagles—for a rousing performance of “Blue Collar Man (Long Nights).” It was released on CD July 24, 2015. After 14 years, STYX’s sonically sweet 16th studio album and its most ambitious, most challenging, and most rewarding album to date, THE MISSION, was finally released June 16, 2017 on the band’s label, Alpha Dog 2T/UMe. It debuted on various Billboardcharts, including: #6 Top Rock Albums, #11 Physical Albums, #11 Vinyl Albums, #13 Current Albums, #14 Billboard Top Albums, #16 Retail, #17 Mass Merch/Non-Traditional, #29 Digital Albums, and #45 Top 200 Albums (includes catalog and streaming). 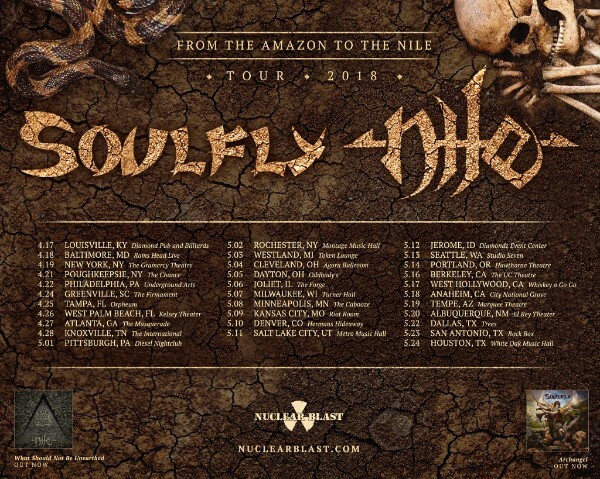 Metal icons SOULFLY and Egyptian themed technical death metal champions and label mates NILE are proud to announce their 2018 From The Amazon To The Nile co-headlining U.S. tour! The 35-date trek kicks off at Diamond Pub and Billiards in Louisville on April 26th and will make stops in Atlanta, Cleveland, and West Hollywood before ending on May 24th in Houston, Texas. “We are thrilled to have the opportunity to bring NILE fans in the States a last round of touring supporting the “What Should Not be Unearthed album”, comments NILE founding member KARL SANDERS.“Teaming up with SOULFLY is going to make for a killer package sure to please Metal Fans. SOULFLY‘s latest album, Archangel features a slew of guests including Todd Jones (NAILS), Matt Young (KING PARROT), Richie Cavalera (INCITE), Igor Cavalera (LO DY KONG), and Anahid (M.O.P.). Watch the lyric video for “Soomites” on the Nuclear Blast YouTube channel. Brian Kingsland and Brad Parris of Nile talk touring, new Nile music and the replacing of original vocalist/guitarist Dallas Toler-Wade with Todd Owens of Capital Chaos TV during their recent stop @ Silms in San Francisco, California while on tour opening for Overkill. 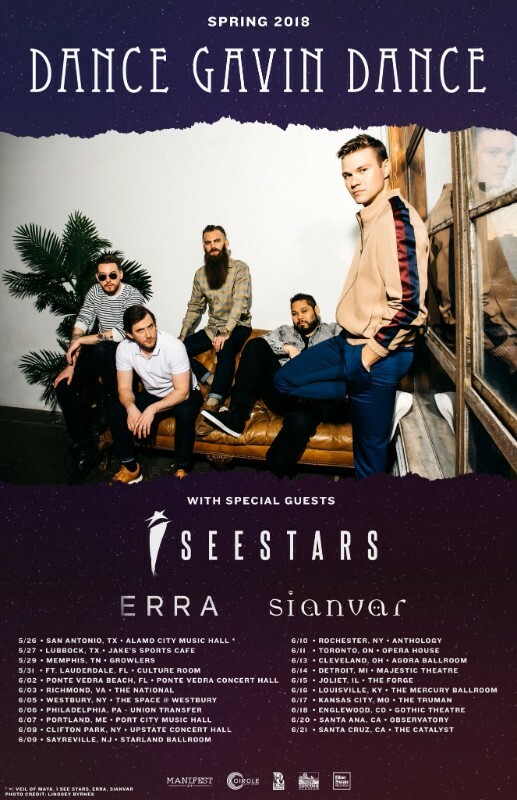 Tickets for the tour are now on sale at Enterthevault.com. All other outlets will have the tickets available for purchase on Friday, November 17 at 10 a.m. local time.